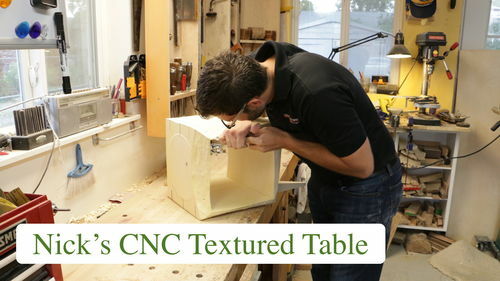 Nick has taken one of his side table designs to the next level by adding a textured pattern with a CNC machine and he explains to us the inspiration and process in creating the design. You can see Nick’s work at Pare Furniture+Design and you can follow him on FaceBook and Instagram. The project design was inspired by Jeff Martin, a furniture maker from Vancouver, British Columbia, Canada. Jeff has a great portfolio and is getting awards for his designs. You can check out his work at Jeff Martin Joinery. You can also follow Jeff Martin on Instagram.